Numerous studies in recent years suggest that modifiable lifestyle factors contribute to the health of the entire body, including the brain. Among these factors, occupies a leading role in providing mains power: a healthy diet is the first tool to keep our body and our brain healthy. James T. Becker, of Pittsburgh School of Medicine (Pennsylvania, USA), and colleagues analyzed data collected on 260 cognitively normal men and women enrolled in the Cardiovascular Health Study. Data on their feeding, including the consumption of fish, were obtained by a questionnaire, and the subjects were also subjected to magnetic resonance brain imaging (MRI). 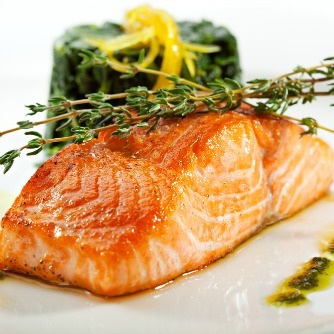 Data from the study showed that people who ate baked or broiled fish at least once a week had larger volumes of brain gray matter in areas of the brain responsible for memory (4.3%) and cognition (14%), than those who do not eat fish regularly. Not only the fish baked or broiled contains higher levels of omega-3 compared to fried fish, because the fatty acids are destroyed with the 'high heat frying. The study authors write that: "The food consumption of baked or grilled fish is related to higher volumes of gray matter and promotes a greater conservation of omega 3 content in the food."